Chic loft/condo with endless upgrades in the Santana Row Margo building. Modern glass tile & custom paint throughout, upgraded bath with vessel sink. Plush queen platform bed offering a serene & private nights rest. Custom lighting hardware throughout and FREE dedicated underground parking space in secure garage below the building. 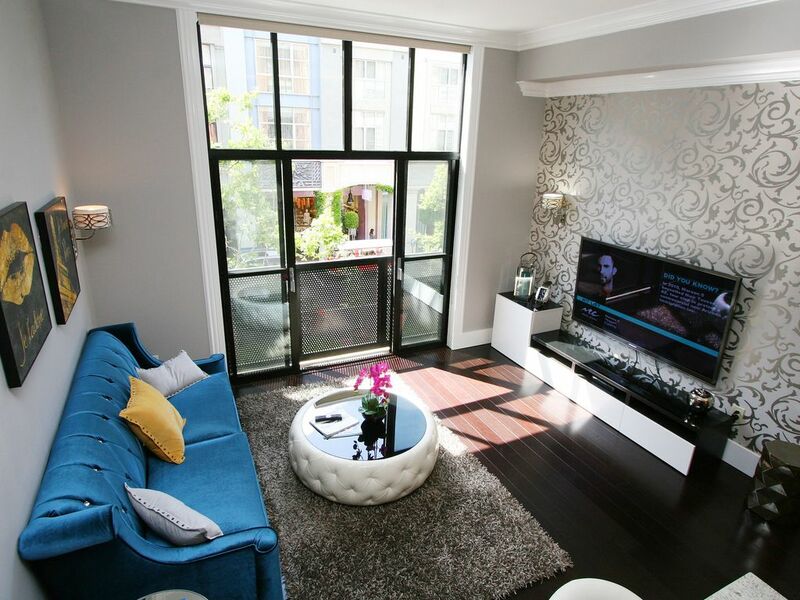 Luxury flat is located in the most desirable area in Silicon Valley, Santana Row. "The Row" is an upscale residential, shopping, dining, and entertainment complex in San Jose, California. Everything is within walking distance. There is no need to drive. The condominium is perfect for business travelers or family vacationers. The loft has a spacious queen bed with an in-suite full bathroom and closet. o If you book for 3 people a Twin XL air mattress will be set-up upon your arrival. o If you book for 4 people a Queen air mattress will be set-up upon your arrival. o Complimentary High Speed Wi-Fi internet. o Complimentary coffee and tea. o Business ready: Wifi, printer, and paper. o Modern full size kitchen with granite counter tops and major appliances. o Facing the Row for the best people watching spot you could ask for. o If time of booking is within 7 days of arrival date a government-issued ID will be required prior to check-in . This is due to recent fraud activity and for both our protection. Santana Row is an upscale outdoor shopping mall in the heart of San Jose. Santana Row offers a mix of brand name shops, local boutiques, twenty restaurants, nine spas and salons, CineArts movie theatre, and the boutique hotel Hotel Valencia. The shops range from luxury brands such as Gucci and Kate Spade to more casual brands like Diesel, H&M, Ann Taylor LOFT, and Urban Outfitters. Also on The Row include restaurants ranging from local concepts like Left Bank Brasserie and sister restaurant LB Steak, Pizza Antica, and Blowfish Sushi, to chains like The Counter, Maggiano's Little Italy, Pinkberry and a Yard House. The district is anchored by Crate & Barrel, Best Buy, The Container Store as well as Valley Fair Shopping Mall. Visit the Santana Row website for more info. This condo is very clean and kept up to date with no expense spared. The pictures reflect it's current state and there are no surprises. This loft is directly on Santana Row street above Kit & Ace and LuLulemon. From your window you can see Tesla Motors, Straits Cafe, Gucci, and Cocola Bakery. It's really the ultimate location if you are staying on Santana Row or San Jose. Hello, I'm Johnny and have multiple listings on VRBO and have been listing the condo on other popular sites where I have plenty of five star feedback and positive reviews so book with confidence. I'm a working professional in the Silicon Valley and was also raised and born here in the Bay Area. I personally have high expectation when staying away from home and I hope my condo meets yours knowing you are traveling away from your home. I strive to exceed expectations to all my guests with the up most respect and respond quickly. I'll ensure the unit is thoroughly cleaned with fresh bed sheets, towels, and bath rugs upon your arrival. I have multiple properties in Santana Row and I'm also a resident, so I am very familiar with the area, the building and it's daily operations. Please feel free to ask me any questions! This condo is very clean and kept up to date with no expense spared. The pictures reflect it's current state and there are no surprises. This loft is directly on Santana Row street above Kit & Ace and LuLulemon. From your window you can see Tesla Motors, Straits Cafe, Gucci, and Cocola. It's really the ultimate location if you are staying on Santana Row. We really enjoyed the property! Everything was there for our convenience... Excellent location with many restaurants to choose from!! The apartment is lovely and very comfortable and it is very well equipped. It is in a great location and in a very safe and secure building. Being located at Santana Row with access to stores and restaurants is great as well. Also, it's just a short walk to the Safeway and CVS. I will definitely stay there again when I am back in the area. Johnny makes it very easy and seamless to check in and out. Thank you so much! Great place and excellent location! I have stayed here a number of times. Always have a good experience and Johnny makes it all seamless. We visited San Jose to see our daughter and the condo worked out perfectly for us. Our flight into San Francisco was delayed and we arrived very late at night, Johnny was wonderful to get us in so late. The check in instructions were very detailed and easy to follow, the condo was immaculate and very comfortable, it was nice to have a parking garage and not have to search for a place to park. We would definitely recommend it! This room was absolutely wonderful. So close to all the shopping and activities that we were able to walk to most of the things we wanted to do! Johnny was an amazing host, always helpful and attentive. I highly recommend this room. My sister and I are definitely planning on coming back, and hopefully for more than just a weekend! Santana Row is the heart of San Jose and has everything you need right downstairs from the condo and in walking distance. If time of booking is within 7 days of arrival date a government-issued ID will be required prior to check-in that matches credit card used to book . This is due to recent fraud activity and for both our protection. I hope you understand I live in the same building should you need anything during your stay.